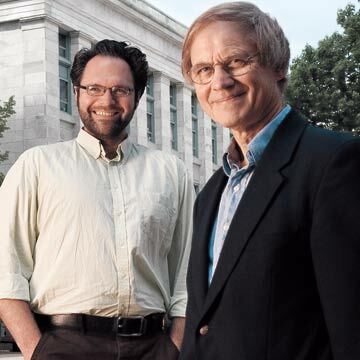 With their online Journal of Negative Results in Biomedicine, editors Christian Pfeffer and Bjorn R. Olsen are encouraging physicians to re-evaluate clinical practices based on negative data. When chatting with colleagues at scientific meetings, postdoctoral student Christian Pfeffer often found that they had conducted the same experiments he had—with the same negative outcomes. Convinced of the need for a forum to discuss such failures, Pfeffer and his mentor, Bjorn R. Olsen, professor of cell biology at Harvard Medical School and dean for research at the Harvard School of Dental Medicine, found a willing publisher in London-based BioMed Central and, in September 2002, launched the online Journal of Negative Results in Biomedicine. The journal challenges scientists to rethink their experimental designs and questions, and encourages physicians to re-evaluate clinical practices based on negative data. Q: What kind of negative results does your journal publish? Olsen: It covers the spectrum of negative results—though “negative” is a misnomer because in the long run the results may turn out to be positive. Some contradict what scientists believe are well-founded tenets and dogmas. Barbara McClintock, for example, spent decades showing that genes can pop in and out of the genome in different locations. That work, for which she eventually won the Nobel Prize, disproved the prevailing view that the genome is very stable. Others may rule out an effect of a drug that was implied by the results of previous, imperfect studies, such as the idea that estrogen should be used to treat osteoporosis in women. Q: What about critics who say it’s a waste of time reading about what isn’t right? Pfeffer: Information, whether it supports or contradicts an idea, is what drives science forward. The philosopher Karl Popper pointed out that only one black swan was needed to repudiate the theory that all swans are white, which is what Europeans believed for thousands of years until the exploration of Australia introduced them to black swans. Olsen: Science is not about finding truth in an absolute sense. It’s about solving problems and developing the best possible explanations for specific questions. So it’s important to consider a range of data, from the most “negative” to the most “positive.” When Thor Heyerdahl sailed across the Pacific to Polynesia on the Kon-Tiki raft in 1947, he didn’t prove that those islands were populated by people coming from South America instead of from Asia, as was commonly thought. But he did open the possibility, which forced experts to consider options other than the prevailing view. Q: You typically publish one to four articles a month, which isn’t very many. Olsen: We don’t get a huge number of submissions, which isn’t surprising because most researchers tend to look for data that have a positive thread. Plus, postdocs and young faculty members who want tenure try very hard to publish in high-impact journals, and that isn’t our journal yet. But five years from now, if the journal continues to attract scientifically defensible articles, then I would consider it to be successful. Q: Have changes in biomedical and life-science research made this journal more relevant today than it would have been 15 years ago? Pfeffer: Sophisticated screening techniques today, such as those that scan the entire genome, create a flood of data, all of which can be interpreted in several ways. Asking which genes are altered by a cancer metastasis, for example, will produce a plethora of genes, but not all will follow the cellular processes we expect to see, and we may not yet understand how these cellular processes are linked. So researchers have become more open to publishing these controversial or ill-fitting results, which can contribute valuable information about a biological process. Olsen: Also, some of the most exciting discoveries are occurring at the boundaries between classical scientific disciplines. For example, the fields of molecular biology and medicine are coming together to uncover the molecular basis of diseases. When scientists venture into areas where they are less experienced, they need to be open to both positive and negative results.